Hot off the release of their first No. 1 and fifth studio album, Death of A Bachelor, (Fueled By Ramen/DCD2 Records), Panic! At The Disco is teaming up with Music Choice, the #1 music network, to encourage high school students to take part in the ultimate video challenge. 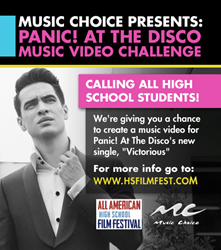 Starting today, submissions are open for a new All American High School Film Festival (AAHSFF) category entitled Music Choice Presents: Panic! At The Disco Music Video Challenge. Students will create their own unique music videos for Panic! At The Disco’s latest single, “Victorious.” The winning video will air on Music Choice On Demand, the Music Choice App and premiere at the 2016 AAHSFF (AMC Theaters in Times Square). The deadline to submit music videos for the Music Choice Presents: Panic! At The Disco Music Video Challenge is July 11th 2016. All submissions for this category are FREE. Submission rules and regulations and complete information regarding eligibility for the 2016 All American High School Film Festival are now available at http://www.hsfilmfest.com/. Questions regarding submissions may be directed to info@aahsff.com. The winner will be selected and presented with an award by Music Choice at the 2016 Teen Indie Awards, Sunday October 9th 2016. The winning film will be used in Music Choice marketing materials and air on Music Choice On Demand. For more information on Music Choice, log on to http://www.musicchoice.com. The All-American High School Film Festival is the premier destination for talented high school filmmakers and media arts enthusiasts from around the world. To date they have received over 3,000 films from 48 states and 33 countries. Each year, in the heart of New York City, the organization presents the largest high school film festival in America offering a grand stage for the next generation of talented filmmakers. The festival will take place October 7-9th and includes screenings of 500+ films (Judges include: Kristen Stewart, Ed Burns, Brittany Snow, Dylan McDermott, Alysia Reiner, Morgan Spurlock and Andrew Jenks), industry panels, the largest film and Media Arts college fair in the country, networking events and the Teen Indie Awards providing over $200,000 in prizes and scholarships. Las Vegas' Panic! At The Disco is an internationally acclaimed rock band that has earned the band international acclamation and a fervent fan following around the globe, also receiving a number of major honors including multiple Grammy® nominations and the prestigious MTV Video Music Awards "Video of the Year" prize for the "I Write Sins Not Tragedies" video. The band broke into the scene in 2005, with their double platinum-certified debut, A Fever You Can't Sweat Out. Their acclaimed second album, Pretty. Odd. arrived in 2008, debuting at #2 on SoundScan/ Billboard 200 album chart upon its initial release. They returned three years later with Vices & Virtues with the album entering the SoundScan/Billboard 200 at #7, while also coming in at #2 on SoundScan's "Alternative Albums" chart. The band's fourth studio album, Too Weird To Live, Too Rare To Die! made a top 2 debut on the SoundScan/Billboard 200 upon its 2013 release. Currently, the band is celebrating the success of their new release, Death Of A Bachelor that took them straight to #1 on the Billboard 200 Chart and #1 on iTunes in over 18 countries. Visit: http://www.panicatthedisco.com.